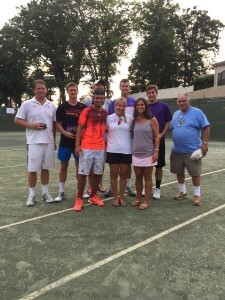 On August 29th & 30th, 2015, R Baby’s Maryland Chapter hosted the 4th Annual Maryland Tennis Event at The Hillendale Country Club in Phoenix, Maryland. The event was a great success, raising close to $50,000, bringing the 4 year total to more than $200,000 toward life-saving programs throughout Maryland. Congratulations to the winners of the Men’s Pro-Invitational Tournament, Paul Burgin and Justine Shane, against finalists Matt Lennox and Dale Cathell. The Pro/Am and Clinic participants had fun playing with the Pros and it was stated many times that the spectators enjoyed watching some great tennis! Thank you to event chair Lisa Asher, co-chairs Henry and Brenda Belsky, committee chair Joanna Lewis and tennis chair Matt Bilger who continue to make this a special and successful annual event.